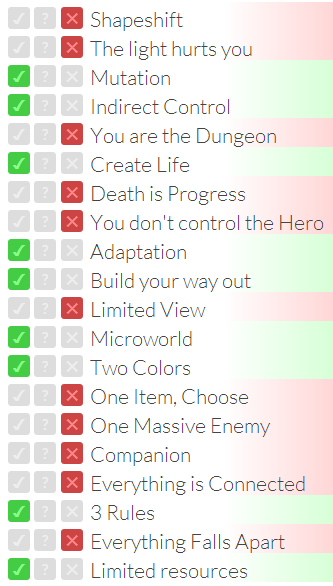 It's a good idea to share Ludum Dare theme votes. Here are the themes which inspired me the most much. My mutation game won't be about X-men. Instead I'm going to make a game about animals: plant-eaters and predators, they'll gain various kinds of mutations and this will affect their survival skills. Since long ago I have an intention to make a civilization-like strategy, but where the player won't give each unit an individual order. Perhaps this LD will finally give me initial push for this. This will be a strategy game! :) The inhabitants of a planet threatened by the meteorite must advance technology far enough to escape the planet (or even the universe via some kind of a portal), to survive. I especially like this theme for art restrictions. I'm bad at art and I hope this constraint will help me make a good visual style for a game. And it leaves vast field for gameplay. But I think I'll invent the gameplay which will have something to do with these two colours, too. I have a challenging game where there are just 3 rules, here it is. Making another fun and challenging game having a constraint like this is a great LD task. I can make a game to informally teach the player how to solve the optimization problems from the Operations Research discipline. And I'll make it fun for sure. See you at Ludum Dare 35, good luck!